The world of introducing convergent devices is a tricky one. 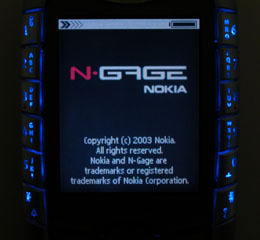 Following on the heals of their combined music player/mobile phone, Nokia launched their mobile phone/music player/games machine, the N-Gage, in October and its has been a shaky start. Before its launch, lots of people were less than positive, and following it, the reviews have not been great. Despite Nokia claiming to have shipped 400,000 units to retailers, the number of customer sales is thought to be low. This has lead to some discounting, to the point where it was available for 1 pence in the UK, if you took a particular service contract out with it. Nokia will be following the business model for other games platforms, sell the box for a minimum margin (or try to minimise your losses), then make your money in the medium to long term on licensing games for the platform. The same theory as razors and razor blades. Clearly this model only works if you sell the games as well. Nokia will not like the latest news. A Swedish hacking group claim that they have got around the protection system that ensures that N-Gage games only play on the N-Gage. They have showed photos of the some N-Gage games running on a Siemens SX1, it’s not clear if these are mock-ups or real. If true, the impact is far reaching. Games written for the N-Gage will run on any phone running the Symbian operating system and according to Symbian, over 2.68 million handsets were shipped with their OS in the first half of 2003. The damage does not stop with them only losing sales of the N-Gage hardware, but that once the games have been extracted from the N-Gage and are stored digitally unprotected, people will be able to download them – not have to buy them for between $35-$40 each. BT have joined up with a partner, Ringtones Online, to offer ringtones, graphics and games for mobile phones. Potential customers will be able to freely browse a dedicated website on the street using the BT Internet Kiosks, then select, preview and purchase their choices. Payment can either be by inserting cash directly into the machine or electronically using credit card, text or by calling a premium rate phone number. Customer will pay £2 for the content, expect for games, which will be £4.50. By offering them from the street they are hoping to encourage the impulse purchasing. 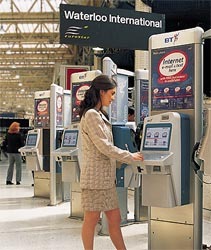 BT has been spending lots of money installing these electronic kiosks in to high street around the UK. Providing a small-form colour screen, trackball and a keyboard, the blue-coloured phoneboxes, which are unusual in the UK, have so far reached over 1,400, with over 90% of them having broadband access. They see them as a way to offering Internet-based services and products to people who don’t have Internet access at home or at work. We think this is an interesting distribution point that has been gradually adding services, both physical, such DVD rental via lastminute.com and electronic, such as photo & video services, enabling friends to send more animated messages. LG Electronics have unveiled their latest mobile phone, incorporating a PDA and 1.1 mega pixel camera which can record one hour of video. 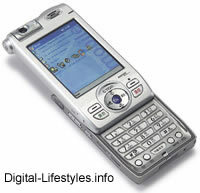 The handsets (LG-SC8000, LG-KC8000), which incorporates the ability to record one hour of video, and edit photos, runs on Windows Pocket PC 2003 and has 192MHz of memory. 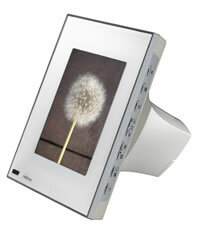 It features a slide-down keyboard, helping to keep its size down, while maintaining a large screen size, 2.8 inch TFT LCD capable of displaying 262,000 colours. They plan to release it in Korea at the end of the year. We feel this looks and sounds like a significant step forward in integrated mobile device design and can’t wait to get our hand on one. In only three and a half days since Apple released the Windows version of their iTunes software, over one million copies have been downloaded. In the same period, one million songs have also been purchased, halving the time it took to reach same level when the Apple only version was released back in April. Although the headline figure of songs downloaded initially sounds very impressive, we would assume the million songs must include ones bought by the current Apple users as well (Apple UK weren’t able to clarify this as they didn’t have this breakdown, Apple US were unreachable) – working out at an average of under one song per Windows user. This shows that people have been downloading the Windows version of the software and possibly not purchasing songs. We think it is likely that this is due to them currently being unable to buy music, as they live outside the USA. Following the announcement of their intention to purchase a month ago, Nokia completed the purchase of the sega.com business unit from Sega on 16 September. As we covered when the deal was announced, Nokia hope to gain a lot of knowledge and experience of online, multi-player gaming, that they see as vital to the success of their N-Gage gaming platform. Having already built the most commercially successful online grocery shopping service in the world, UK supermarket chain Tesco is taking its online ordering service to the Smartphone. They are now accepting applications for beta testers, who will start the three month trial in October. If it proves successful, it is hoped that the launch of the full service will start in Spring 2004. An on-air connection is not required when creating the shopping order, or when browsing details of items that have previously been ordered. A connection is required when actually placing the order or browsing the other 20,000+ items that are available. A few T&C’s apply such as needing to own a phone handset running Microsoft Smartphone 2002 or the new Windows Mobile 2003 for Smartphone; be a UK resident and be prepared to carry out a shop through your phone. A new service has been launched in the UK to enable willing participant to have the position of their mobile phone tracked. mapAmobile is currently working on the Vodafone, O2, Orange and T-Mobile networks. It works by monitoring the strength of signal from aerials and triangulating between them. They claim accuracy within 50 metres but this will vary depending on the density of aerial, so rural locations will be less accurate. Priced as ~£30 for a year for one phone, there is a charge of 30p each time the service is used, which is slightly strange given they’re selling it as an alternative to texting or phoning the person. Registration is either online or a voucher can be bought at Carphone Warehouse. On signup, the target-tracked phone is sent an SMS asking for approval to be tracked, as well as regular reminders. The location can be interograted either online, via SMS or telephone and will be given as ‘Fred is in the vicinity of Bow Street, London WC2’ together with the date, time and accuracy of the location. You will also have the option to see a map showing street names and points of interest. Real Networks have announced its intention to acquire Listen.com for around $36m in cash ($17.3m) and stock. They’re gaining the music assets (they have around 320k tracks on their service), their technology, subscribers (however there may be) and openings to their distribution agreements with a network of more than fifteen companies. There’s further talk about the Apple online music service that is slated to launch on 28th April which will only be open, initially at least, to users of Apple computers. Apple only has 3% of the computer market but this worked in their favour when try to get access to the big five record companies content for the service. The music companies felt they weren’t exposing themselves and their content to the whole World, allowing them to “dip their toes in the water” of a different, non-subscription model. I think it’s interesting that the proposed launch date is just one day before the Vivendi meeting, where they were rumoured to be making their intention to bid for Universal. Possibly co-incidence — potentially a great way of getting free press for the service.